Floral Park Deputy Mayor Kevin Fitzgerald, liaison to NYRA/Belmont, last month at a Belmont Arena development information session. Fitzgerald raised concerns over the additions to the plan. 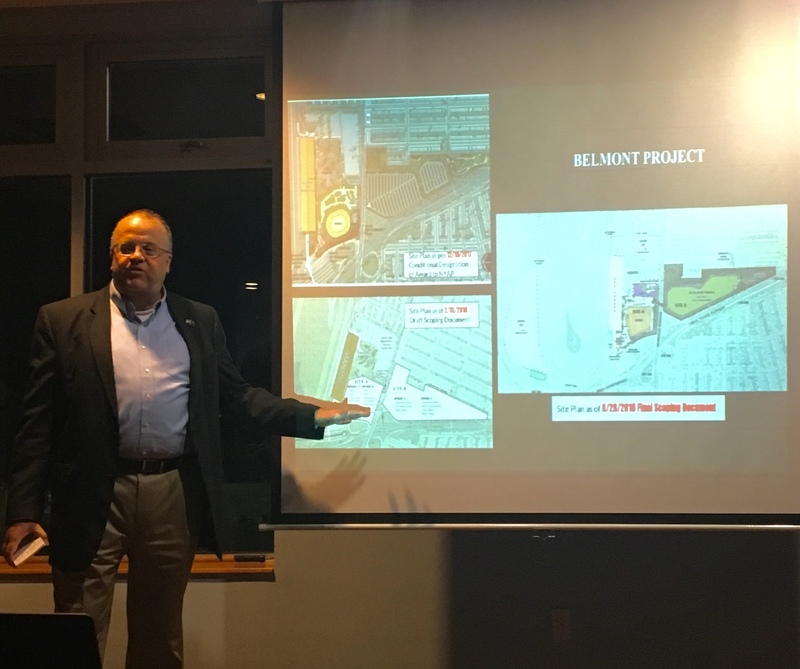 A power substation for the Belmont Arena development is no longer slated to be built behind Floral Park-Bellerose school, according to Empire State Development representatives. PSEG Long Island, without the ESD’s knowledge, originally planned to place a power substation necessary for the development relatively close to Floral Park-Bellerose High School, according to Empire State Development Community Relations Vice President Marion Phillips at a Floral Park Chamber of Commerce lunch Thursday. The substation’s new location is approximately near exit 26D on the Cross Island Parkway, on a lot of unused space next to the proposed north parking lot. “It’s not near children, it’s not near houses and it makes a lot more sense to do it that way,” Phillips said. Critics of the plan to develop Belmont Park into an arena for the New York Islanders hockey team have expressed concern over the scope of the project, which has grown over the course of the project’s timeline. In addition to the arena, the proposal includes a hotel, retail area, parking lots and the potential for the New York Racing Association to expand at the location. The proposed hotel was 250 rooms and 26 stories but backlash from the community resulted in a reduction to 150 feet with the same number of rooms, widening the base of the hotel and aligning it better with community values, Phillips said. The retail space will not be a mall similar to anything in the area, Empire State Development Real Estate Development & Planning Vice President Tom Conoscenti said. The project is currently on track to have a final draft environmental impact statement this quarter of the year, Conoscenti said. If all approvals are met, ground could be broken on the project as early as the second quarter of 2019, Conoscenti said. “If the traffic study says the Cross Island Parkway needs to be expanded to six lanes from three on each side and it’s gonna cost $347 million to do that and the moneys not there, is the project still going to move forward?” Chamber of Commerce Past President Michael Jakob said.